Katrina’s Toy Blog will help you appraise your toys! I currently offer 2 types of appraisals: Basic and Deluxe. Basic appraisals cost $19.99. A basic appraisal will briefly identify your item and consist of my professional opinion of current market value. No additional questions about the item are included. Deluxe appraisal will cost $29.99. A deluxe appraisal will be much more detailed than the basic appraisal and that will include much more information. It also will give its Fair Market, with high and low current comparative items that have sold in recent weeks. Up to 10 questions about the item are included. If I have more questions I will email you. Please allow up to 7 days for us to complete your appraisal. Completed appraisals delivered via email. Please note that not all items can be identified. Some are that are very hard to find information about are unmarked, tourist and souvenir dolls, cheaper made toys and dolls such as dolls sold in supermarkets, or local artist dolls. Sometimes I can only give the approximate age of the item, and maybe where it came from. I will not charge for an appraisal that I cannot find enough information about. I can give general information and the value of the item if you wish, but I would contact you and let you decide if you want to pay for an appraisal with limited information. Thank you so much for the fast response on my request for an appraisal. I am so pleased to learn of the value of Jeremy Glen “Little People” doll by Xavier Roberts. I just wanted to leave some feedback on the appraisal I just received. I had an Xavier’s Little People doll and there is SO much info out there that it is just too confusing!! 🙂 Katrina answered all of my questions (and I had several) and provided more information on top of that. She also gave me some examples of other dolls values that were similar. If you want a toy appraised, this is a great place to get that done. Katrina just did appraisals for my Xavier Roberts Little People/Cabbage Patch dolls that were so specific about the different factors that added to or subtracted from their value. I couldn’t believe how much detail she was able to provide! It turns out my dolls are more valuable than I had realized and now I have the info I need to sell them for what they are worth. This is definitely the place to find out everything you need to know about special toys. I have a Cabbage Patch doll, purchased at Babyland General in 1999. She is part of a special collection who all had the middle name “Bea”. I thought she was a preemie, but she’s not a newborn, She is of course hand signed and her tag has this number: BCP99/27 handwritten on it. It his what you would consider a “rare collectible”? I’m not sure off the top of my head. The best way to find out is to purchase a basic appraisal. Yes! This doll is definitely a collectible! What’s the best way to determine her value? I’m interested in selling…. Is there a location I can visit to get an old teddy bear appraised or are you only available online? Thanks again for the appraisal and the professionalism with which you handled my request. If the opportunity should arise I would be very happy to recommend your services in the future. Thank You very much for the detailed appraisal! We may have had a tough start (due to my typing) but I am very satisfied. I will certainly retain your site for future requests. I would like to send photos of my Little People Dolls dated tags 1979. I’m not sure if I need an appraisal or if you might simply be willing to purchase them? Toy selling is not the primary part of my business any longer, so I do not buy many at this time. You should sell the dolls on eBay. 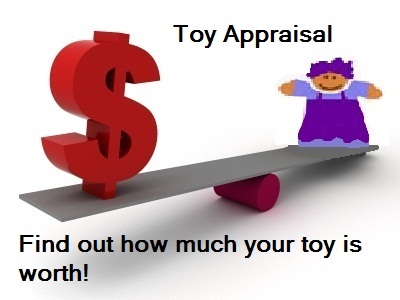 If you are not sure of your dolls’ values, then you will need appraisals. Here is the link to my appraisals page. Email me if you have any questions about my service. Thanks for visiting my blog, please subscribe! How do i Getafe an appraisal? I can’t get it to work. If I have more than one doll, do I need to buy multiple appraisals? Yes, unless the dolls have all the same features of age, signature, features, condition etc. Most people do not have the knowledge to know for sure, so the safe bet is to purchase an appraisal for each doll.